When you analyze your email marketing program, what is your email data telling you? Measuring your data can be difficult, but knowing what to do to next is even harder. 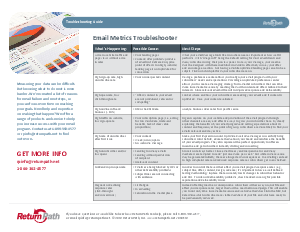 Identify issues quickly with the “Email Metrics Troubleshooter” checklist, so you can focus less time on identifying problems and more time on reaching your goals. With this list of reasons for email failure and recommendations for next steps, solve problems quickly and easily.